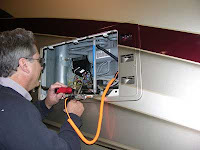 Ken, in all instances of internal appliance component replacement, it is always prudent to use like components. In your case, it’s best to have your service shop order the exact replacement part for that propane tubing. Chances are it is a metric size and it might be difficult to located metric copper tubing. And then flaring or double-flaring (depending on the model), creates another stop-gap. It is much easier to order the part and simply replace, like for like. Keep in mind, whenever any propane line is disconnected, a timed pressure leak test must be performed. And since yours is an older unit, it might be a good idea to have a regulator lock-up test performed and the delivery line pressure calibrated as well. Typically, these are best left to a Certified or Master Certified technician since it requires specialty devices and exact procedures.